Meet Author Jill Wolfson Friday, April 26, 2013, 6:30 PM On the surface, Jill Wolfson's books are about kids and families in tough situations like foster care, organ donation and bullying. Her stories go much deeper than that and explore these worlds from different perspectives. If you want to know the one and only true response to any of these situations, you may be hard pressed not to see it from the variety of views Wolfson offers up. Wolfson will be presenting her newest book, Furious. About Furious: We were only three angry high school girls, to begin with. Alix, the hot-tempered surfer chick; Stephanie, the tree-hugging activist; and me, Meg, the quiet foster kid, the one who never quite fit in. We hardly knew each other, but each of us nurtured a burning anger: at the jerks in our class, at our disappointing parents, at the whole flawed, unjust world. We were only three angry girls, simmering uselessly in our ocean-side California town, until one day a mysterious, beautiful classmate named Ambrosia taught us what else we could be: Powerful. Deadly. Furious. Yes, that’s us. The three Greek Furies, come to life, ready to take our revenge on everyone who deserves it. And who doesn’t deserve it, really? We’re done with chances. We are angry. The Furies have come to town. Jill Wolfson was born and raised in Philadelphia, Pennsylvania. After attending Temple University, she worked as a journalist for newspapers and magazines around the country, such as the Fort Lauderdale (Florida) Sun-Sentinel and San Jose (California) Mercury News. 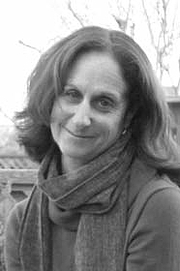 Her award-winning novels for young people include What I Call Life; Home, and Other Big, Fat Lies; Cold Hands, Warm Heart, and Furious, all published by Henry Holt. Jill has taught writing at several universities and is a long-time volunteer in a writing program for incarcerated teens. She lives in a beach town in Northern California. Book swap will follow the presentation and signing. Here's how it works: Bring: A book you’ve read and liked but can part with. (Be ready to talk a little bit about why you liked it.) Leave with: A book recommended by a fellow book-swapper, a free book (advanced reading copy) from Hicklebee's and a list of other great reads you'll want to explore. Please RSVP ~ (408) 292-8880 or email us at hicklebees@hicklebees.com. Recommended for 13 & up. Please spread the word to everyone you know. Jill Wolfson's book Santa Cruz Noir is currently available from LibraryThing Early Reviewers. Jill Wolfson is currently considered a "single author." If one or more works are by a distinct, homonymous authors, go ahead and split the author. Jill Wolfson is composed of 1 name.